Jack Warner refers to Hopper’s collection of toy soldiers as a kid. Indeed, this is what the small ‘Dawn Before Gettysburg’ feels like amongst the large, epic depictions of battle lining the walls. Despite its small size, ‘Dawn Before Gettysburg’ stands up to its bedfellows in emotional impact. 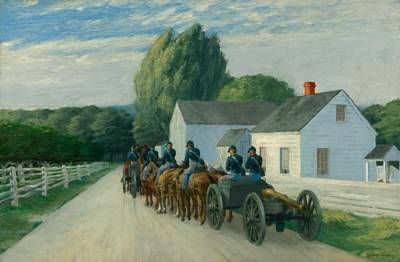 Hopper himself relayed a story, told to him by a guard at the Museum of Modern Art, about Albert Einstein’s viewing of ‘Dawn Before Gettysburg’ in a show at MoMA. It’s easy to see why this little painting has made such an impact over the years. The colors are breathtaking, in particular the blood red of the dawn sky. The individual soldiers are just that: individuals. As Warner points out, one has a blister on his foot from marching. Another has just vomited and is leaning on his friend, deathly ill. A standing soldier is getting orders ready, representing duty to his country. Hopper incorporates a series of metaphors into the picture. The picket fence, perhaps representing Picket’s Charge, each fence top possessing an eerie resemblance to a headstone. The road, whither it leads these men and to what fate? The dawn itself, perhaps their last. Down the hallway from the Civil War rooms hang works by Hopper’s artistic compatriots. In the modern art room are pictures by George Luks and Robert Henri, including the spectacular ‘Marjorie in a Yellow Shawl’, a portrait of Henri’s second wife. There are excellent examples of American Impressionist William Merritt Chase and other greats of the late nineteenth century. Represented are portrait artist John Singer Sargent and Winslow Homer, one of Hopper’s most lasting influences and arguably the most important artist in American history. The two other Hopper pictures originally in the Warner Collection, both watercolors, have been divested recently. Warner tells me that the proceeds of their sale may have gone towards the purchase of a Mary Cassatt painting. But he dislikes being reminded of paintings that have been deacquisitioned and will not be pinned down as to details. ‘It makes me sad and sick,’ he says mournfully. Jack Warner, though, is a man who is quick to move on. As I leave the museum he has struck up a laughing conversation with a new group of visitors. He launches into a story about his three favorite redheads: Washington, Jefferson and Lafayette. Sadly, the sale of pictures from the Westervelt Warner Collection is now a common occurrence. Since my visit, the museum has changed names and locations. It is now the Tuscaloosa Museum of Art. Gone are several spectacular pictures, including one of Warner’s favorites, ‘Progress (The Advance of Civilisation)’ by Asher B. Durand. 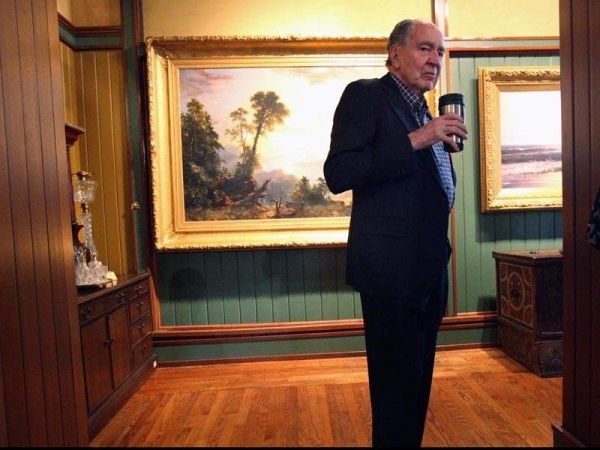 Pictures from the collection Jack Warner built are being sold by the Westervelt Corporation to raise money, much to his chagrin. For now, ‘Dawn at Gettysburg’ and many of its Civil War compatriots remain in Tuscaloosa. One wonders for how long. Fascinating post, as usual, Jim! Your profiles of the collectors are terrific (and often left out of standard art historical writing), and I love your stories of the paintings’ peregrinations–and of your own journey to trace them to the contexts in which they now reside. You also give me the opportunity to look again and think about some of the Hoppers that I’ve glossed over. To me, “Dawn at Gettysburg,” has a theatrical quality, with the soldiers on the grassy “proscenium,” and the dawn is the curtain going up on what will soon be the next act, the next battle. The backdrop of the house is like a scrim for the interlude, soon to be replaced. And of course the peaceful, still-sleeping house underscores that this bloody war was staged not in some far-away foreign field, but against the familiar American landscape. Thanks Bonnie. That’s very true about the peaceful house highlighting that this war was fought in the ‘homeland’. I’ve felt that way during my own visits to Civil War battlegrounds, which were literally people’s backyards. As the journey continues, and as I approach New York, I’ll go further into the history of the few key individuals who made Hopper’s career what it was. As much as Hopper stubbornly said that his only influence was himself, he couldn’t have made it without the help of others.